First, FRP grid acid, alkali, organic solvents and salts, and many other gas, liquid medium corrosion. Sinta FRP grating in the field of corrosion has incomparable superiority. Its chemical medium does not occur under the influence of electrochemical corrosion and rust, will not make the structure of the material is damaged, do not need regular or irregular inspection, maintenance, it is also different from wood and other materials will rot, Mildew and other phenomena, is the traditional iron, wood, cement and other materials upgrade products. According to the requirements of the actual use of the occasion, can choose the use of o-benzene, m-phenylene, vinyl-based resin as the base material. Second, the lightweight high strength GRP grille. FRP grating is made of resin and fiberglass composite, its density is smaller, compared with the steel grid, the density of FRP grid steel 1/4, 2/3 of aluminum, and the intensity of rigid polychlorinated Ethylene 10 times, the absolute strength of more than aluminum, to the level of ordinary steel. Its light weight, can greatly reduce the basic support, reducing the material cost of the project. The cutting and installation is simple, without moving fire and large lifting equipment, only a small amount of manual and electric tools, making the installation costs are greatly reduced. Third, FRP fire retardant fire safety. Typical glass epoxy molded grids have an oxygen index (measured according to GB 8924) above 32 and a flame propagation rate (according to ASTME-84 test) of one flame retardant grade; flame retardant vinyl grid with a flame propagation rate of 10 or less Access to the American Bureau of Shipping (ABS) approval. Glass fiber reinforced plastic grille impact and anti-fatigue higher than other materials. FRP grid has a high impact strength, allowing repeated bending without permanent deformation, and the metal grid by the impact, the retention of permanent deformation, to be repaired. FRP grid has a moderate elasticity, making the long-term work of the staff feel comfortable, reducing the sense of urgency of the staff legs and back, reducing the incidence of accidents, help to improve production efficiency. V. GRP grille skid performance. FRP molded grille with anti-skid function, through the molding of FRP grille has a natural form of non-slip surface and two non-slip sand, non-slip sand surface mold sand and one after forming and demolding by bonding Reprocessing sand agent two, both of which paving sand surface provides superior anti-skid function, the sand is not easy to peel, durable. The use of fiberglass grille makes walking more safe and comfortable, greatly reducing the accident caused by slipping staff. VI FRP grating anti-aging, beautiful, easy maintenance. FRP grating selection of high quality resin, glass fiber system made of products to ensure that the service life of more than 20 years. According to the research on the aging properties of FRP products by national research institutes, the results show that the strength of glass fiber reinforced resin products infiltrated with special glass fiber can still be kept above 85% after 20 years of atmospheric exposure. 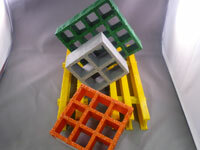 FRP grid is to reconcile the paste into all the resin made of its bright color, not easy to fade, no paint, unlike the paint is not limited to the surface, the resin-filled smooth surface and the ramp-type inner surface of the grid has a self Cleansing effect, even with dirt, with water or detergent is also very easy to wash, make the grille surface smooth as new. VII. FRP electrical insulation high safety. FRP grid has excellent electrical insulation, 10KV voltage without breakdown and flashover phenomenon, the use of conductive platform in the work of hazards, floors, fences and other areas, reducing the conductive area and the switchgear around the shock due to the staff No electrical spark, the use of FRP grid to avoid flammable and explosive places due to the tool off the metal grille may produce sparks and cause an explosion, fire danger. Eight, FRP grating installation easy. FRP grating makes the weight of the components greatly reduced, thus reducing the weight of the support structure, the installation does not require the use of lifting equipment, saving and convenient. Nine, FRP grating low cost Comprehensive high economic efficiency. FRP grating manufacturing cost is 1.4-1.8 times that of steel grating, the installation cost is only 20-40% of the carbon steel, FRP grid maintenance cost is almost zero, but the steel grid every year to be maintained, the cumulative maintenance The cost greatly exceeds the total cost of the GRP grille. Although the initial investment cost of FRP grille is slightly higher than that of steel grille, the total economic benefit is 4-5 times that of steel grille, which is one of the main reasons for the large-area FRP grille abroad.